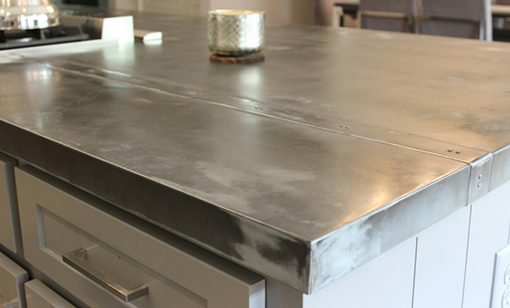 Did you know that zinc sheet metal is an ideal material for countertops, sinks and commercial and residential bar tops? Zinc sheet metal contains many highly desirable properties when used for countertops and is a viable alternative to stainless steel. Zinc sheet metal can last for more than 100 years, and the exact color and design are dependent on the food, liquids and other items that come in contact with the metal. Zinc countertops are extremely popular in Europe, and they are becoming popular in the United States due to their resistance to corrosion and anti-bacterial and stain resistant properties. Zinc metal has antibacterial properties that are very similar to copper. Stain resistance is possible due to the non-porous nature of the metal. Items spilled or dropped on the zinc countertop will not soak through the top layer. Instead, the chemical properties of the food and liquids will interact with the metal to create a unique color and design. Our zinc sheets are manufactured from 99.99 percent zinc. For residential applications, we recommend our .027 thickness zinc sheet metal, which is available in a range of standard and custom widths and lengths. Zinc sheet metal is durable and heavy enough to provide a solid surface for cutting and prepping food and beautiful enough to impress your family members, friends and neighbors. It is also easy to clean. Small spills can be quickly cleaned with mild soap and water. For thorough scrubbings, all you need is a dish towel and an all-purpose antibacterial cleaner. Zinc sheet metal is ideal for all kitchen countertops, large and small kitchen islands and breakfast bars. You can even cover existing dining room tables and buffets with zinc in order to create a seamless look and feel from your kitchen to your dining room, and you don’t have to worry about sloppy edges. Zinc can be formed around counter and residential bar tops without losing its strength or durability, and the metal easily accepts decorative edges and patterns so that you can have a completely custom kitchen. We recommend our .060 thickness zinc sheet metal for commercial applications, including kitchen counters and professional bar tops. It can even be used to cover the tops of existing tables to give the establishment a more industrial feel. The inherent properties of zinc metal make it easily customizable, which means you can add patterns to the metal and decorative edges to give it the right amount of flare and visual interest. You can even lightly hammer the metal to create a complete unique look. Zinc also develops its own patina, which changes the color over time. Initially, your zinc sheet metal will arrive sporting a silver or gray hue. As certain chemicals, water, drinks and food come in contact with the metal, it will develop a blue-gray hue that may include a little brown. It’s also easily cleanable with soap and water or a damp towel and some anti-bacterial, food-safe cleaner. Our high-quality zinc sheets are available in .027 and .060 thicknesses. To provide you with the best quality and most versatility, our sheets are manufactured and shipped unfinished. This gives you the opportunity to create the right look for your interior and exterior needs by either installing it unfinished or buffing and polishing it until you have the right level of shine. If you need to incorporate two sheets of zinc metal in order to get the right length, the material is easily welded and sanded to create a seamless finish. To learn more about our zinc products or to order zinc sheets for your residential, commercial or industrial application, call us at 1-877-777-7NEY. We would be happy to talk to you about your zinc sheet metal needs.